Thunderbolt was known to attend country race meetings and take note of the winners that he would later steal. It is claimed by some that this inspired him to return to Tocal to steal the great racehorse Free Trader. There is no documentary evidence to support the claim and it might be just a good story. Free Trader won the Grand National Steeplechase in England in 1856 and was imported to add value to the bloodline of the Tocal horses. Tocal was at the time one of Australia's leading horse and cattle studs. Legend has it that Thunderbolt hid in the loft over the stables attached to the supervisor's cottage and stole Free Trader from under the noses of the residents of the cottage. It was this quality of horse that allowed Thunderbolt to outrun the police on several occasions. The brick stables at Tocal were probably built to protect the Tocal racehorses from theft by bushrangers like Thunderbolt. This theory is supported by the inclusion of bars on the windows and locks on the doors and the concern for the security of the famous racehorse 'the Barb' while he was at Tocal. 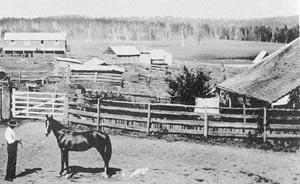 Photograph:One of Tocal's thoroughbred horses, with Thunderbolt's cottage at the right.